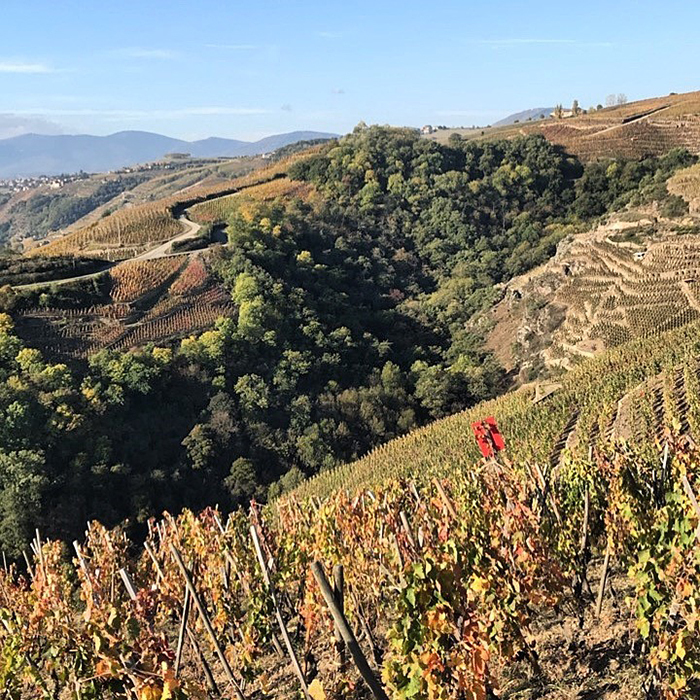 Two weeks in the Rhône Valley towards the end of October can be symphonic in its autumnal livery, the balmy low Provençal sun-scapes dressing the vines in the unique colours of post-harvest repose. Until, of course, the Mistral (usually unannounced) gets going and the blue skies take on an icy Van Gogh stare. Poetry aside, it’s a wonderful time to assess the harvest that has just been farmed and to get to grips with the wines from the previous vintage, 2016, most of which are still in cask, but already close to the finished article. Apart from the black teeth, I can report that the experience has been extremely pleasurable and that the wines from the ‘16 vintage, especially in the south, are excellent in every respect – harmonious, beautifully pure and elegant, but not without the backbone required for a happy period of cellaring. Producers really on song are legion, but it would be rude not to mention exceptional efforts from Ogier, Allemand, Coursodon and Mouton in the north. As for the south… where to start? Well, particularly standing out, outstandingly, were Janasse, Marcoux, Usseglio, Oratoire Saint Martin, Montirius, Dieu-le-fit, Chaume Arnaud and a new-look La Nerthe: enough to be going on with. We’ll be inviting most, if not all, of these growers over to London in March, so you can taste for yourselves. 2017: Quality but minimum quantity. Virtually all the growers have been attacked by at least one of the four horsemen of the vinous apocalypse; hail, frost, disastrous fruit-set (coulure) and drought (sécheresse). In the south they had 225mm of rain by the end of October (the annual norm being over 600) and winters are usually quite dry. The story doing the rounds is that the enigmatic but influential Emmanuel Reynaud at Rayas pronounced that he would not harvest until the rain came. It is alleged that he still has not harvested; in any event, it still has not rained. This is the third dry year on the trot; its effects are cumulative and already there are worries for 2018, as the water table drips onto a tabula rasa. 2016: Quality and quantity – that’s more like it. The received wisdom is that the reds are better the further south one goes, with attractive ethereal whites resplendent across the piece. Indeed, this is the first time of tasting young wines in two decades where the quality has been immediately and gloriously apparent; with the ‘15s (a far from negligible year), by comparison, tasting awkward and somewhat disjointed. The ‘16s all have a lift, a purity and a wealth of fruit, self-assured by the fact that the high acid levels are natural and not forced/added. The tannins are sublime, phenolic ripeness achieved with minimal effort. There was no canicule, with just enough rain (a little on 14th September, for example, could not have been better – post white, pre-reds) and bounteous yields. The north was more difficult, certainly: spring frost and a rather lacklustre, “humid” August compromising matters, but overall I was pleasantly surprised. More qualitative variety than in the south for sure, but those who did not over-extract (intellectually or otherwise) have been rewarded with attractive wines, which recall 2006 – a vintage that has always seemed under-rated to me. Welcome back to Blighty. After the reported frosts this spring, I feared the worst – the whole harvest TOAST. Looking forward to your further reviews, recommendations and tasting in (the Ides of) March.